If your Bindo stores are part of a chain you have the option to implement chain-wide price changes using a single form on the Bindo Dashboard. This function is available to users with Admin permissions for the chain. This permission setting must be configured by Bindo Support for you - to request Chain Admin permissions for your chain contact support@bindo.com. 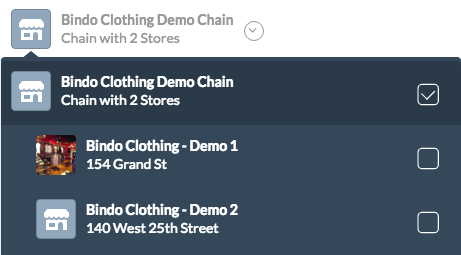 Once you have access as a Chain Admin you'll see a new store listed in the store dropdown at the top of the Bindo Dashboard. The store will have the word "Chain" at the end, and all individual stores in the chain will be listed and indented below it. Select the checkbox to the right of the chain (and only that checkbox). With the chain selected you'll see a different menu on the left hand side of the page with one option called "Item Master". Find the item for which you'd like to do a price change by scrolling or using the Search function. Click on the arrow to the right of the item and click "View". Once on the item detail page click "Edit" at the bottom right hand side. Edit the price field and click "Save". Price is now updated across all locations.